The wave of protests on the streets of the GDR reached its peak in early November 1989. 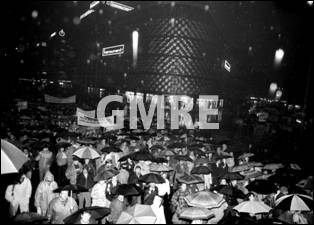 Even pouring rain on November 6, 1989, could not keep the people from demonstrating – up to 500,000 people took part in the most powerful Leipzig Monday demonstration. They demanded more and more clearly the reduction of the SED's monopoly on power, free elections, admittance of new opposition groups and unrestricted freedom to travel. The state party's inability to reform had led to increasingly radical demands. 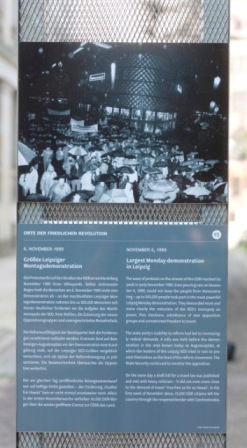 A rally was held before the demonstration in the area known today as Augustusplatz, at which the leaders of the Leipzig SED tried in vain to present themselves as the head of the reform movement. The State Security continued to monitor the opposition. On the same day a draft bill for a travel law was published and met with heavy criticism – it did not even come close to the demand of travel "Visa-free as far as Hawaii". In the first week of November alone, 45,000 GDR citizens left the country through the reopened border with Czechoslovakia.